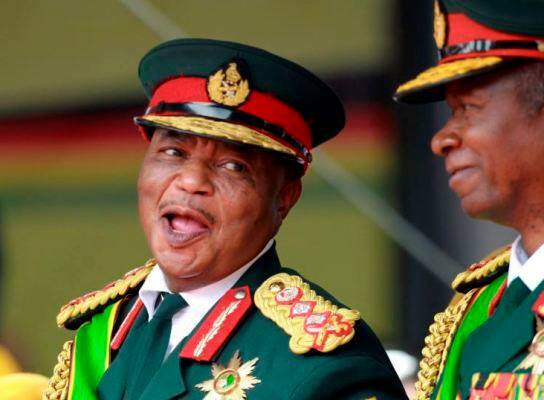 It was indeed the end of an epoch when Zimbabwe Defence Forces (ZDF) bade farewell to their Commander, Rtd General Constantino Chiwenga during a farewell parade at 1 Commando Barracks in Harare this Tuesday. General Chiwenga retired yesterday after serving in the force for decades. There is no doubt that he will be remembered for playing an instrumental role in the recent Operation Restore Legacy that ushered in a new political dispensation in Zimbabwe. Today was therefore his last day at the helm of the ZDF, as he handed over the baton to his deputy, General Phillip Valerio Sibanda. Those who witnessed the occasion included the Commander in Chief of the ZDF President Emmerson Mnangagwa, the Chief Secretary to the President and Cabinet Dr Misheck Sibanda and his deputies Rtd Colonel Christian Katsande and Dr Ray Ndlukula, the Minister of Defence, Security and War Veterans Cde Kembo Mohadi, military attachés of diplomatic missions accredited to Zimbabwe, spouses of senior military officers including Mrs Marry Chiwenga, representatives of business, Zimbabwe Prison and Correctional Services, Zimbabwe Republic Police, the Minister of State for Harare Metropolitan Province Mrs Mirriam Chikukwa and many other dignitaries. In his address, Rtd General Chiwenga took stock of the contributions of the country’s defence forces at different stages of Zimbabwe’s history. He also spoke about contributions of the ZDF in civilian life that include floods rescue missions, schools construction and the National Defence College, among many other achievements. He then reiterated the current government's thrust to rebuild the economy and attain food self sufficiency. Rtd General Chiwenga urged serving ZDF members to continue to work hard and support the incoming Commander in the same manner they supported him for peace and prosperity in the nation. He stressed the need to continue building on previous successes gained by those long gone commanders that include Cde Alfred Nikita Mangena, Cde Vitalis Zvinavashe and others. After delivering his farewell address, General Chiwenga immediately handed over the colours of the defence forces to his successor, General Sibanda. This was followed by the signing of the hand over take over certificate before President Mnangagwa. In his acceptance speech, General Sibanda said General Chiwenga has led defence forces for last 13 years and faced many challenges which he and the ZDF team managed to find solutions for. General Sibanda said he is humbled to have been chosen to lead the defence forces, adding that the ZDF is one of the biggest assets of the country, pledging to look after the welfare and needs of its members. President Mnangagwa also addressed the gathering, saying the ZDF has a huge task to protect and safeguard Zimbabwe and its territorial integrity. He said in his illustrious career, Rtd General Chiwenga has maintained hard work and commitment to the country. “Maintain that loyalty in your next assignment,” said Cde Mnangagwa. He added that defence forces should work closely and professionally as displayed during the recent Operation Restore Legacy.